Utah is filled with natural wonders to impress almost any hiker. 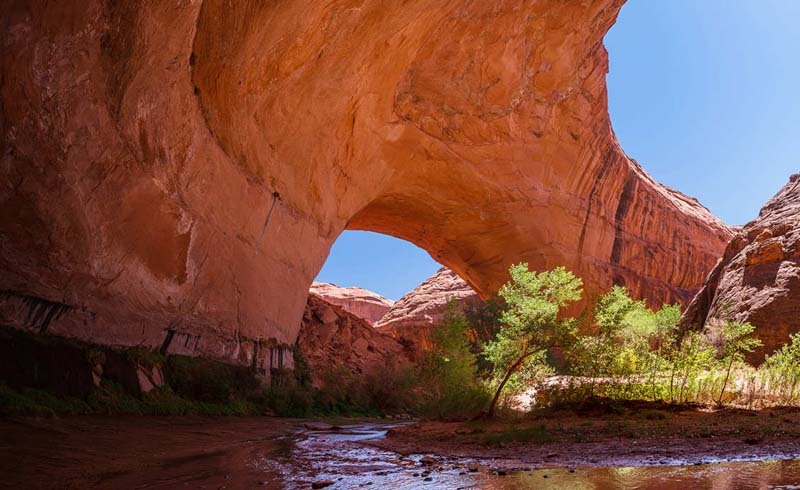 From picturesque waterfalls to winding slot canyons and natural sandstone arches, here’s where you should explore in stunning Escalante. As I pulled into yet another scenic overlook on The All-American Road: Scenic Byway 12, I realized that getting to Escalante might take a bit longer than Google had suggested. After all, Google didn’t take into account the multiple stops to try and fit this sprawling majesty into a picture. Eventually, I gave up on pictures and just stood there, awe-struck by the cliffs striped by ochre, vermillion and taupe, dotted with specks of dark green trees; the road twisted like a discarded black ribbon into the distance. Scenic Byway 12 spans 124 miles and travels through some of the most rugged and isolated parts of Utah. It travels by Bryce Canyon and Capitol Reef National Parks; Kodachrome Basin, Anasazi, and Escalante Petrified Forest State Parks;Glen Canyon National Recreation Area; and Dixie National Forest. On my journey from Denver, I bypassed the always-popular Moab area, with its access to Canyonlands and Arches—perennial favorites with the Colorado crowds—and I’m so glad I did. I stopped to peek at petroglyphs and shoot more ineffective photos of the grandeur of Capitol Reef National Park. But my ultimate destination was Escalante. 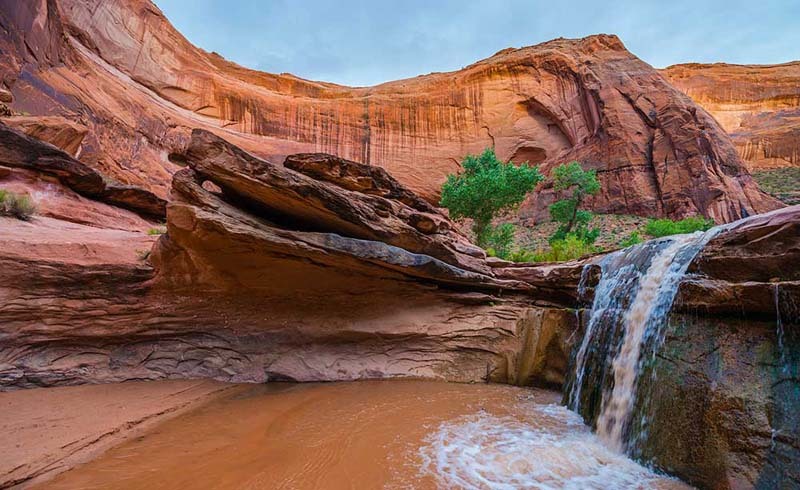 A great warm-up hike, the trail to Lower Calf Creek Falls is located about 15 miles east of Escalante. Covered in sand, the 6-mile out-and-back path is mellow and winds through canyons striped with shades of umber, sienna and red ochre. Grab a brochure for the guided walk at the start and the pamphlet will draw your attention to spots known for beaver activity and petroglyphs carved on the walls. Your destination is a 126-foot waterfall that, unlike most in Utah, cascades all year. Embrace the solitude then head back. Lower Calf Creek Falls tips:Be sure to have your daypack stocked with essentials: a raincoat, sunscreen, snacks, plenty of water and a first aid kit. Even if it’s an “easy” hike, being prepared is key. A $5 fee is charged per vehicle for parking at the trailhead. Half of the adventure is getting to the start of these hikes, a journey that takes you 26 miles down the unpaved, bumpy Hole-in-the-Rock Road, the start of which is located just a few miles outside Escalante at Dry Fork Wash. Head down the short cliffs, following the cairns, and you’ll find the entrance to Peek-A-Boo. Even though they are only three miles long, conquering both of these slot canyons as a loop (which I highly recommend) will take you three to four hours, depending on your skill level and how often you stop to wonder how you exactly you got in there. You don’t need any technical skills, but going at it solo requires more skill and fortitude than I had. Luckily, I met a nice brother-sister duo at the head of the trail so I had company and a hand up at times. Start at Peek-A-Boo, a slot and corkscrew canyon. Scramble up the rock wall (there are “handholds” there, but having a friend or two is super helpful, as are good, grippy shoes) and make your way into the canyon. The sandstone waves, curls and twists, creating an adult jungle gym that at times makes this hike feel more like parkour. At the end of Peek-A-Boo, don’t miss Spooky Gulch, which is just a short hike away. This narrow slot canyon was more fun to me: It required some body contortion to get through the canyon and at one point my two new friends and I were situated in some interesting poses to let another group get through. It’s not a good place for claustrophobes or larger adults (NFL linebackers would have a really hard time here), but you’ll feel like a rock star when you emerge back into startling sunlight. Peek-a-Boo and Spooky Slot tip:Think a money belt is only for international travel? Think again. A belt like this is great for keeping your essentials safe when you’re tossing your pack through canyons. My companion almost lost her car keys in the soft sand of the slot—this would have kept them super safe. This 11.5-mile round trip hike through a long, somewhat narrow canyon can be done in a day, but if you have the time and the camping gear, most people choose to spend the night. Though Coyote Gulch is a strenuous hike that requires some serious rock scrambling, it’s not considered technical. I would not recommend attempting this solo, but if you can tackle Coyote Gulch with a crew you’ll be rewarded with views of natural arches like Stevens Arch and Coyote Natural Bridge. Coyote Gulch Tip:If you’re camping or backpacking overnight, be sure to use your packing cubes to keep wet bathing suits or inadvertently wet and smelly clothes separate from your clean(ish) gear. Three days later, I emerged from my yurt at Escalante Yurts and started home. The last night in these glamping yurts was a treat for me, and I wasn’t ready to leave this spectacular area. However, I know that I’ll be back: there are too many areas that I still need to explore. Where are your favorite hikes in Utah? Let us know in the comments!